This Sunday was my last outing of the month. 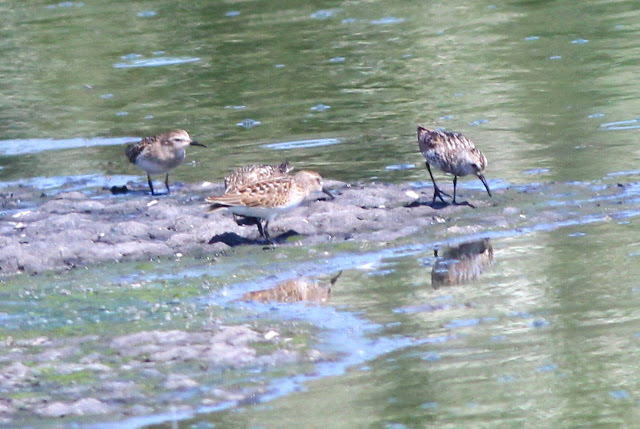 I visited Lighthouse Marine Park in Point Roberts, and then made a quick stop at Iona Regional Park to check out the settling ponds for shorebirds. I experience more anticipation when visiting this site than any other local birding location. I think only Frank Lake in Alberta compares, and I only visit there in peak breeding season. 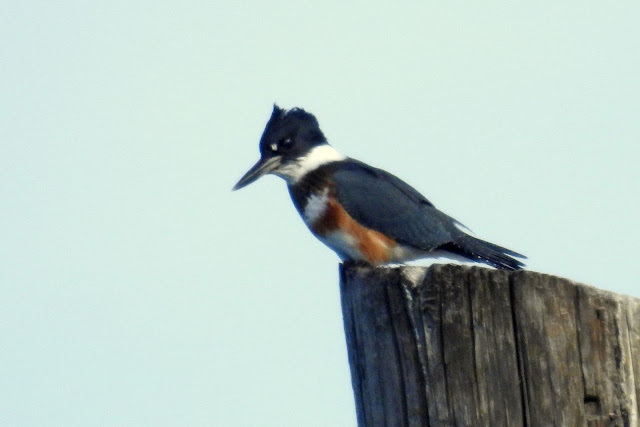 One of the species likely to be seen is a Belted Kingfisher, usually near the Pilings on the Northwest side of the park. Today it was a female, sometimes I see a male in the same area. 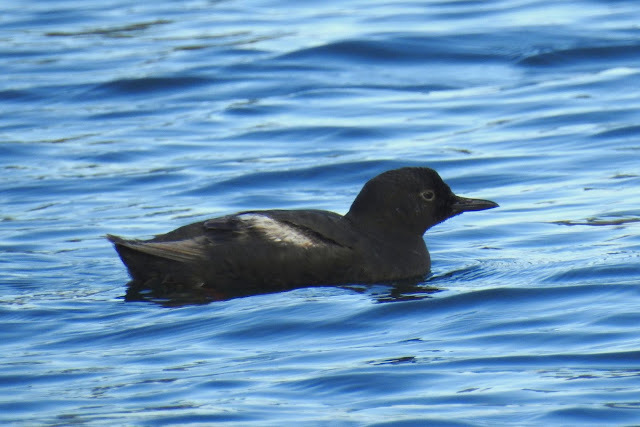 Also near the pilings was a Pigeon Guillemot. It appeared to be molting into it's Basic (non-breeding) plumage. Back by the parking lot I caught sight of a small bird on a perch. 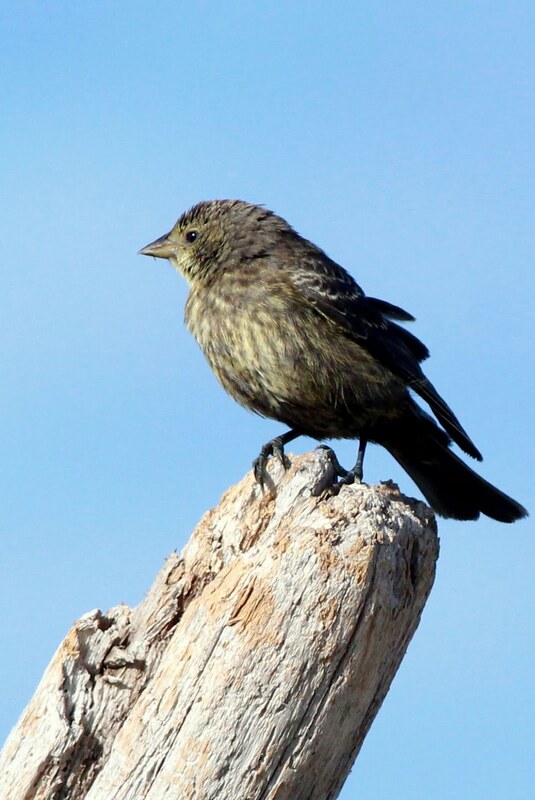 I believe this is a female House Finch. I headed south towards the small lighthouse, a location where many birders scope the ocean for seabirds. On my way, I took a shot of a pair of gulls on the shoreline. 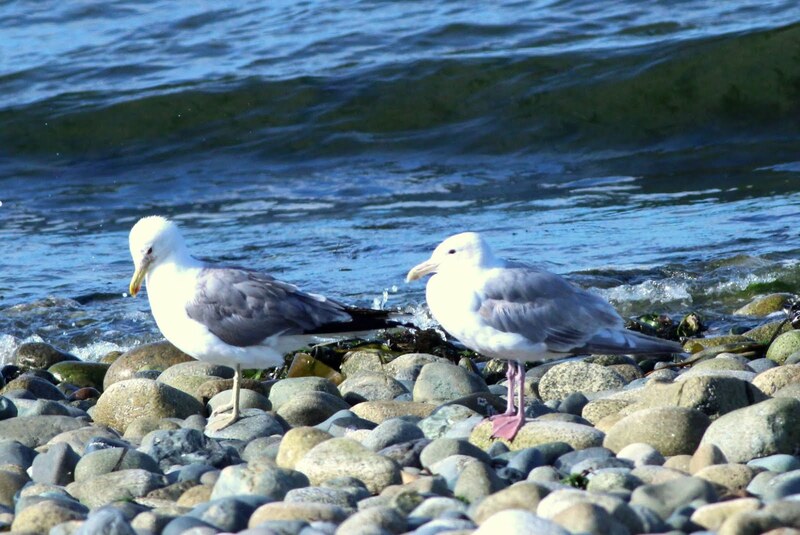 The one on the left is a California Gull, told by the yellow legs and the red tipped bill (often with black as well). The other bird is a Glaucous-winged Gull, told by the pink legs, overall gray wings and tail and the bill markings. 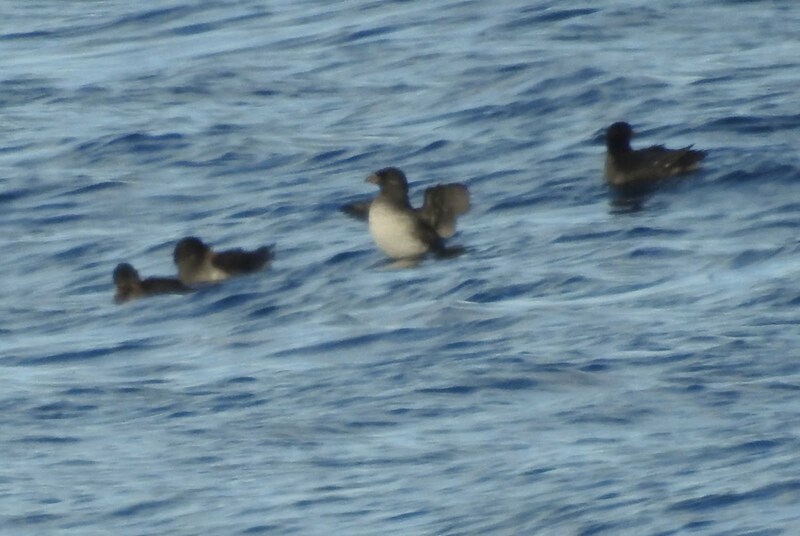 Another birder pointed out some Rhinoceros Auklets, quite far out from shore. I took this shot with the Nikon, zoomed out as far as it could go. Of course, this greatly reduces the quality of the shot, but at least it's a record for the year. There wasn't much else to see, so I decided to head north to Iona Regional Park. I only had time here for a quick check of the sewage (or settling) ponds. Only the Southwest pond had a substantial amount of water at this time. Water levels in the four ponds at the Sewage plant are raised and lowered as needed by the plant. There were a few small shorebirds working the pond and I noticed one that was larger. It was a Spotted Sandpiper. 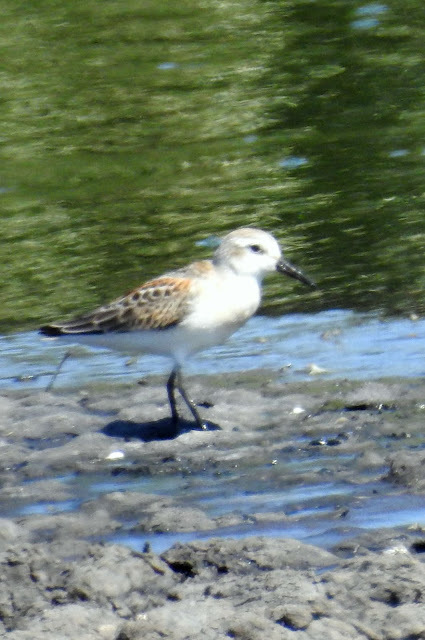 The bird appears to be misnamed, but if you refer back to earlier posts from June, I had some photos of the bird in its spotted breeding plumage. The smaller bird on the right is a Least Sandpiper. 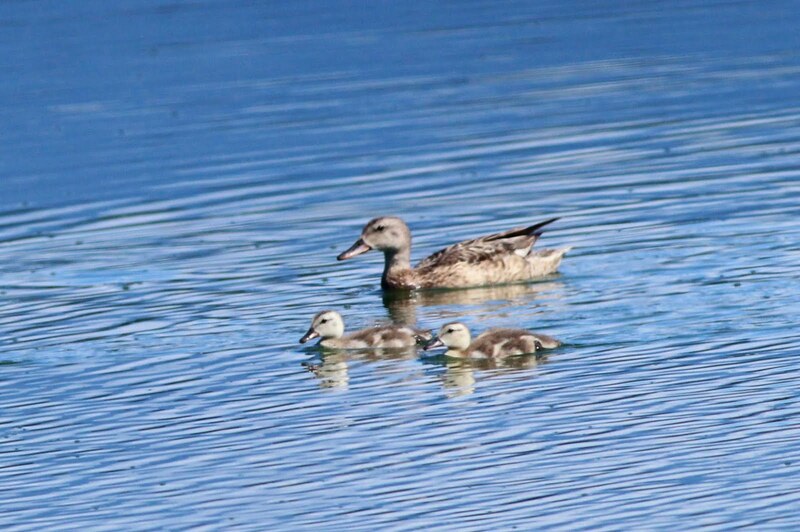 There were some young Mallard Ducklings out for a swim with their mother. 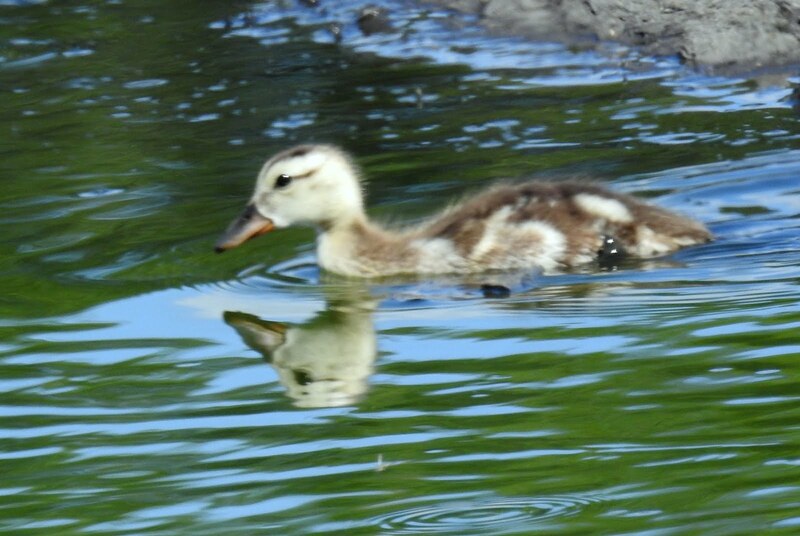 Here's a close-up of one of the youngsters. Finally, here's a photo with some Least and a Western Sandpiper. The Least have yellow legs and a short-ish bill. The Western has a much longer bill and black legs. This was my last stop for the day and for the month of July. 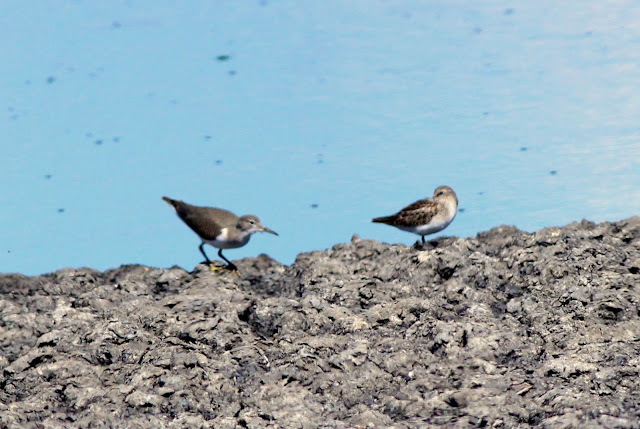 The birding slows down considerably in August, except for the migrating shorebirds arriving at Boundary Bay.